The dolphins are great balancers for us of our more serious nature and responsibilities (whale energy) so we can enjoy life, have more fun, and play more often. Do you remember my blog about the Mermaid Pleasure Hour? They mermaids asked me to spend at least one hour a day doing something pleasurable as I can tend to be too serious. Hawaii brings out my playful side and the dolphins help immensely. 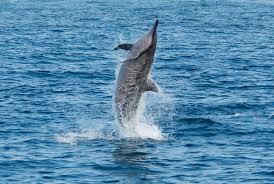 Even if you are not in Hawaii or near dolphins you can call if their energy, joy, and fun. Here is a message from the dolphins to ease your way into new patterns of fun… just in time for the magical gateway of Leo eclipse (Wed Jan 31st 2018). as it pulsates all around you, and in you, and above you, and below you. bubbles of joy, and squeeks of delight. Read this message outloud and let the energy of the dolphins reach deep into your heart. They will swim within you and offer their love, magic, and joy! For those who wish to join me on a magical retreat —Flowering with Land & Sea — on the Big Island of Hawaii and connect with the dolphins and whales and spirit of nature, click here. January 29, 2018 in Uncategorized, Water. Who is Your Nature Spirit Guide for WATER? a Mermaid? Dolphin? Goddess?